I am really enjoying experimenting with new salad ideas at the moment. All the new season's veggies are coming out and there are so many different fresh ingredients to play with! This salad is one of my favourites so far. It really just doesn't feel like a salad as it has so much going on. The tomatoes are slightly roasted to bring out the flavour and the almonds are lightly cooked in sumac to give them a zesty hit. Add a lemon and honey dressing and you're taste buds are in for a treat. I avoided leaves in this salad as I really didn't want to go for a 'salad' feel, wanting it to seem more filling and luxurious. Instead I chose asparagus and avocado to give it a satisfying fullness. You can of course always add some greenery - I would probably go for spinach or rocket to keep things tasty. This salad travels really well and can stay dressed in the fridge overnight, making it a perfect , satisfying packed lunch. Cut the cherry tomatoes into quarters, then place them on a baking tray in the oven for 10 minutes. Steam the asparagus for about 5- minutes, or until al dente. While the tomatoes and asparagus cook, roughly chop the almonds and place them in a bowl with the olive oil and sumac, then mix until the almonds are evenly coated. Gently heat a frying pan , then cook the almonds for about 2-3 minutes, until they begin to brown. Remove the tomatoes from the oven and the asparagus from the steamer and leave to cool while you make the dressing. Put all of the ingredients in a cup and mix well. Chop the avocado into small cubes and tear the basil leaves into pieces. 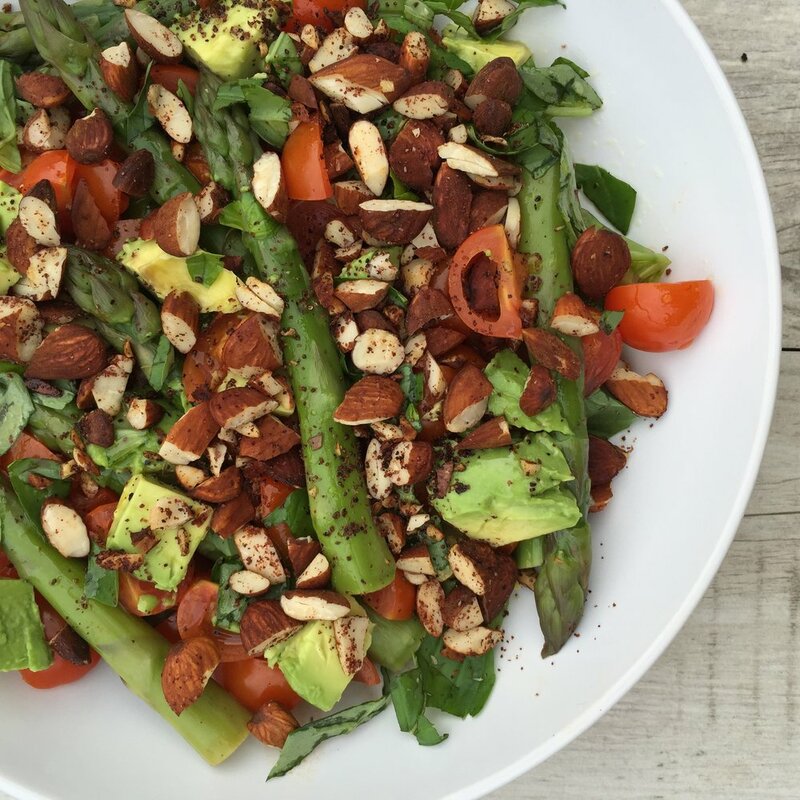 Place the asparagus, tomatoes and avocado in a large bowl, then add the basil and almond, dressing the salad to serve.